So this week I decided to toot my own horn and show a little handmade album I've made: a very girlie Brag Book for a mother, grandmother, aunt etc. A sweet little A5 handbag-sized Japanese stab-bound album decorated inside and out: the overall size is 15cm x 10.5cm (5.75in x 4.25in) with 12 pages of marbled pink card, all bound with pink organza ribbon. Hope you like it! (I just put it into my Etsy shop - only took me about 2 hours to list it). My blog of choice this week is U Create - with some wonderful make-its, including shaker style boxes, a twisted fabric flower drum light shade and all sorts of lovely stuff. Do take a look! This photo albumn is just precious. Perfect for any little girl baby. Just perfect. You did an awesome job. Looking at it has given me some ideas of what to do maybe with the one I am going to make for our new grandson that will be coming in June. Your style is so beautiful. Lovely creations Susie. Love the design. Going to U create now. What a wonderful idea,such an amazing book...I love all looks hre!!! Thank you SO much for you answer,my dear virtual friend!!! 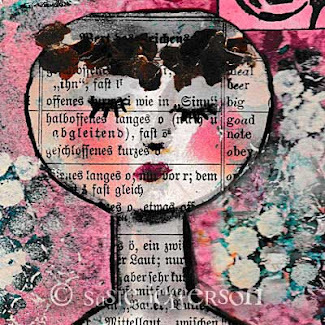 Susie that is the sweetest pink inspired book - you are so creative and should never hesitate to toot your horn!!!! My mum always taught me that. Susie, I'm in such a funk because Google just won't update the storage I've recently paid for and I can't upload any photos from my PICASA account where Blogger stores them! What's a gal to do when Google has NO customer service in place either by phone or e-mail? I've spent hours trying to communicate with Google and Picasa to no avail - details on my post today without pics of course. Where do you keep your pics? Do you have any suggestions for me - you are so savvy when it comes to computers! How does one upload photos directly from MY PICTURES - as some gals seem to do? Should I scrap this Blogger blog and open a new one in Typepad? If that's a better way I'll do it even though one has to pay! I'm tired of Google, they are way too big and very unfriendly. Sorry so many questions, just reply if you have time. I'm so behind now keeping up with blog buddies because of all this frustration, I could scream!! Have a lovely weekend - hope Spring has come to London as my best friend (whom I'm traveling to Africa with) is visiting for a week! You always have something fabulous! Just delightful! Oh, that listing process, so long. I wish there was a genie to help me, too. Hope you are a bit caught up. We both love your book. I hope you are enjoying wonderful weather for this first day of Spring! Happy Pink Saturday, Susie! Toot that horn loud and proud girl! You made a lovely album! The cover is so charming, the sketch of the darling baby girl really sets it off beautifully! I love the inside cover in blue! Beautiful job! Thank you so much for your visit and your lovely comment! I loved your book. It's just wonderful..so dainty and delicate,so sweet. It would be beautiful for any girl. Brag books are so great! I love pinks, but have a hard time finding them to share. You did a great job on the journal. I am so pleased you stopped by for a visit. What a great job you did on your book. I'm glad you posted it today. What an adorable little album, just perfect for PS! It's a shame I do not stop by your blog more often because it is deserving a good look. You are very creative Susie. Happy PS and wonderful weekend and happy springtime to you. Super great!! It is lovely! I like the outlined images a lot!! That is a beautiful album, truly lovely. Thank you for your visit for Pink Saturday! Greetings from Los Angeles.